The Sixth Form College, Solihull are celebrating BTEC success, with final grades revealed this week, demonstrating a record-breaking 350 starred grades. There are 199 second year BTEC students, who have just finished their studies at the College. They have been studying one of six BTEC Extended Diploma courses in Art & Design, Applied Sciences, Business, Health & Social Care, IT Practitioners or Sport. BTEC Extended Diploma courses are equivalent to studying three A levels and are graded with distinction* (star), distinction, merit and pass grades. 73% of students across all six courses achieved at least one distinction* grade and 48% of our BTEC students attained the top triple distinction* grade. One of the most successful BTEC courses at the College this year was BTEC Health & Social Care. Every student on this course has achieved at least a triple distinction on this course, with 96% getting at least one distinction* grade and three quarters of the year group getting the very top mark. Amaarah Hansa (aged 18, from Sparkhill) was one of the top achievers on this course and her success has earned her a place on the Adult Nursing course at Birmingham City University. Fellow student Ellie Roberts (aged 18, from Stetchford) also got the top grade and she is using her success to progress to Birmingham City University as well, in her case to study Midwifery. The BTEC Sport course has also had a great year, with 64% of the students achieving a triple distinction* grade. Gemma Queenborough (aged 19, from Shirley) was one of those students; she also achieved College Colours during her time at College, by demonstrating teamwork, leadership, social responsibility and by completing a challenge. She plans to use her success to work in the field of coaching disability sports; she is already running walking netball sessions. In BTEC Art & Design, 24 students gained high grades (DMM or higher) and 11 students achieved a triple distinction* grade. This is the second consecutive year BTEC students have achieved 100% high grades. 18 students are continuing onto degree courses nationally, across a variety of Art & Design disciplines. 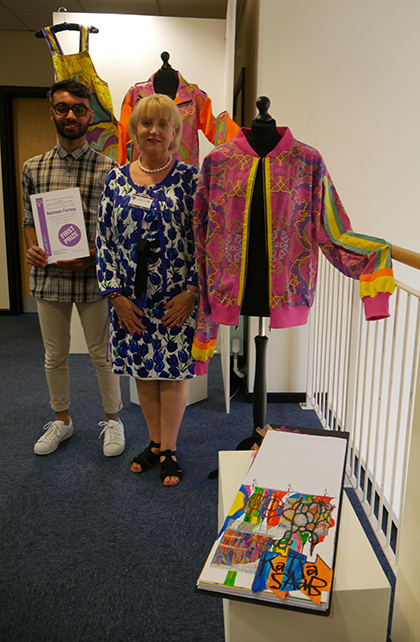 Numaan Farooq (aged 18, from Birmingham), a former Ninestiles Academy student, is one of 11 students with the top grade and he is progressing on to Birmingham City University to study BA (Hons) Fashion Design. He also impressed the judges in the Arden Decorative & Fine Arts Society awards this year. He won First Prize for the 3 fashion garments he created exploring bold colour and pattern, along with a fashion video, evidencing his diverse and multi-disciplinary skills. Both, the BTEC Applied Science and BTEC Business courses saw 41% of students achieving the very top grade, with 85% of Applied Science students getting at least 1 distinction* grade and the same percentage getting at least one distinction in Business. In Applied Science, Waqar Dad (aged 18, from Washwood Heath) was one of 19 students to achieve a triple distinction* grade. He will progress to Aston University to study Health Care in the autumn. Meanwhile, in Business, Zair Afzal (aged 19, from Hall Green) is one of the high achieving students with top marks in his course. He also won this year’s Dragon’s Den competition at the College and is progressing to the University of Nottingham. In the BTEC IT Practitioners course, every students on the course passed and 82% of the students got at least one distinction grade. Thomas Walsh (aged 17, from Solihull) is utilising his top grade to progress onto Coventry University to study Games Technology. “These are terrific results and I’m proud of both the students and their teachers for achieving so highly. These courses are assessed by coursework and lots of it, so they have really had to work hard to achieve these grades. It sets them up well for whatever challenges they have ahead, with the majority of them heading off to university. I wish them all the very best of luck!